To Cite: Abbaspour M, Sharif Makhmalzadeh B, Rezaee B, Shoja S, Ahangari Z. Evaluation of the Antimicrobial Effect of Chitosan/Polyvinyl Alcohol Electrospun Nanofibers Containing Mafenide Acetate, Jundishapur J Microbiol. 2015 ; 8(10):e24239. doi: 10.5812/jjm.24239. Background: Chitosan, an important biodegradable and biocompatible polymer, has demonstrated wound-healing and antimicrobial properties. Objectives: This study aimed to evaluate the antimicrobial properties of mafenide acetate-loaded nanofibrous films, prepared by the electrospinning technique, using chitosan and polyvinyl alcohol (PVA). Materials and Methods: A 32 full factorial design was used for formulating electrospinning solutions. The chitosan percentage in chitosan/PVA solutions (0%, 10%, and 30%) and the drug content (0%, 20%, and 40%) were chosen as independent variables. The release rate of mafenide acetate from nanofibrous films and their microbial penetration were evaluated. The antimicrobial activity of different nanofibrous film formulations against Staphylococcus aureus and Pseudomonas aeruginosa was studied. Results: The results indicated that all nanofibrous films, with and without drug, can prevent bacterial penetration. Incorporation of mafenide acetate into chitosan/PVA nanofibers enhanced their antimicrobial activity against P. aeruginosa and S. aureus. Conclusions: Overall, the results showed that chitosan/polyvinyl alcohol (PVA) nanofibrous films are applicable for use as a wound dressing with protective, healing, and antimicrobial effects. Burns constitute one of the most important and common injuries that can disrupt skin function. According to the area of the body surface affected by burns, it can be classified into three types (mild, moderate, and severe); moreover, based on the depth of the wounds, it can be classified into four degrees. In second-, third-, and fourth-degree burn injuries that exhibit heat-induced skin degradation, the protective effects of skin are lost, and a scar is formed, which is characterized by a wet, alkaline, non-vascular, and protein-rich environment. A scar is a type of open wound that lacks immune function-related cells; thus, it is considered an appropriate environment for the growth of microorganisms (1). Microorganisms such as Streptococcus, Staphylococcus aureus, and Pseudomonas aeruginosa can infect the wound surface within 24 to 48 hours, following which, in 5 - 7 days, Gram-negative bacteria such as Klebsiella and Escherichia coli multiply on the wound surface, eventually leading to the spread of infection (2, 3). Application of topical medication on the scar surface is the most convenient method to deliver antibiotic drugs. Although topical antimicrobial treatment does not sterilize the wound, it reduces the number of bacteria to an extent that can be controlled by the host immune system. Three common topical medicines used in this field are silver sulfadiazine, silver nitrate, and mafenide acetate. Mafenide acetate, a sulfonamide-type antibiotic, is the only drug that is able to penetrate into the scar and inhibit bacterial proliferation in the tight tissue below the scar (4). Scar removal by debridement is one of the treatment procedures. After debridement, the skin’s surface must be covered with a suitable membrane to reduce trans-epidermal moisture loss and prevent microbial infection; this would, in turn, lead to enhanced wound healing. One of the efficient choices for wound dressing is nanofibrous films, which offer many advantages over conventional methods (5). Electrospinning is a simple and cost-effective technique for fabricating nanofibrous films (6). In this method, the polymer solution or melt is injected through a nozzle and charged by a DC electrode; once the critical voltage between the polymer and the collector is reached, the charge imbalance overcomes the surface tension of the polymer, forming a fiber jet toward the collector, where the polymer solvent evaporates, generating nanofibers (7). Different polymer solutions that may be biodegradable, nondegradable, natural materials, or a mixture of these polymers are used in this technique (8). Chitosan is among the polymers considered in the production of wound dressings owing to its unique properties such as healing and bacteriostatic effects, biocompatibility, and biodegradability (9). Despite the desirable features of chitosan, obtaining pure chitosan nanofibers by electrospinning is difficult. To facilitate nanofiber formation, different blends of chitosan with other spinnable polymers such as polyvinyl alcohol (PVA) have been used (10). PVA is a water-soluble, completely biodegradable, non-toxic, and biocompatible polymer that has several biomedical applications such as wound or lesion dressing (11). Despite numerous studies on the efficiency of nanofibers as alternative wound dressing materials (12), few studies have evaluated the effect of topical application of antibiotic-loaded nanofibers on the prevention of wound infections. In a recent animal study, it has been shown that PCL/PEO nanofibers containing nanosilver and silversulfadiazine improve the antimicrobial effect in comparison to that achieved by traditional application of silversulfadiazine cream (13). On surveying the available literature, we were unable to find studies on mafenide acetate-loaded nanofibers. 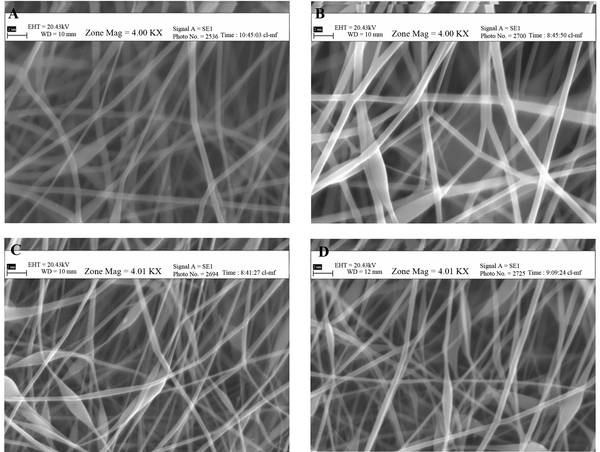 The objective of this study was to fabricate nanofibrous films containing chitosan and PVA by electrospinning, to investigate their antimicrobial effect, to evaluate the effect of incorporating different concentrations of mafenide acetate on their antimicrobial activity, and to evaluate their ability to prevent microbial penetration, with an aim to assess their applicability in burn care. Chitosan with a viscosity < 500 cp was purchased from Primex, Island. PVA of molecular weight 72000 and glacial acetic acid was purchased from Merck (Germany). Staphylococcus aureus (ATCC29213) and Pseudomonas aeruginosa (ATCC27853) were purchased from the Pasteur Institute (Iran). To prepare polymer solutions for electrospinning, a 32 full factorial design was used. The percentage of chitosan in chitosan-PVA solution (0%, 10%, and 30%) and the amount of mafenide acetate in the formulation (0%, 20%, and 40%) were selected as independent variables. PVA solution in water (10% w/v), chitosan solution in acetic acid (2% w/v), and 0.5 g/mL stock solution of mafenide acetate in water were used for the preparation of polymer solutions. Finally, nine formulations containing different amounts of chitosan and drug were prepared (Table 1). The polymer solution was filled in a 10-mL syringe with a metallic needle, which was fixed at a 15-cm distance from a rotary steel drum covered with aluminum foil. A voltage of 19 kV was applied to the polymer solution through an electrode connected to the needle. The collector was also connected to the ground. The speed of the rotating collector was 600 rpm and the feed rate of the solution was set at 1 mL/hour. Surface morphology of the films was evaluated by scanning electron microscopy (SEM) (VP1455-Leo, Germany). The film samples were mounted on aluminum stubs, sputter-coated by a thin layer of platinum under an argon atmosphere by using a sputter-coater (Polaron, England), and then observed by SEM. The average diameter of the electrospun nanofibers was measured from SEM images by using Microstructure Measurement software (Nahamin Pardazan Asia Co., Iran). Vertical diffusion cells (Franz cells) with acetate cellulose membrane between the receptor and donor areas were employed for determining drug release rate from nanofibrous films containing various concentrations of mafenide acetate. Phosphate buffer (6.2 mL; pH 7.4) at 37°C was used as a receptor medium, and it was magnetically stirred at 300 rpm. Film samples equivalent to 4 mg mafenide acetate were placed in the donor area on the cellulose acetate membrane, and they were moistened by adding 200 µL phosphate buffer. Samples were withdrawn from the receptor area at predetermined time intervals and analyzed by UV-spectrophotometry (Biochrom, UK) at 267 nm. To investigate the films’ ability to inhibit microbial penetration, each film was tightly placed on an open test tube containing 5 mL autoclaved nutrient broth (NB) medium. An open test tube containing NB without any covering material was used as the positive control, while another tube that was closed with a tightly packed cotton ball was used as the negative control. The tubes were kept in an open environment for 1 week. The transmittance of NB was measured at 600 nm as an indicator of microbial contamination (14). To determine the minimum inhibitory concentration (MIC) and minimum bactericidal concentration (MBC) of mafenide acetate, a suspension of S. aureus and P. aeruginosa with turbidity equivalent to 1 McFarland standard was prepared and then diluted 1:500 with Trypticase™ soy broth (TSB) (Sigma-Aldrich Co.; USA) medium (15). Using the serial dilution method, 12 test tubes containing different drug concentrations were prepared, such that the concentration in each tube was half the concentration in the previous tube. Then, 1 mL of P. aeruginosa suspension was added to each of these tubes. Similarly, this method was repeated for S. aureus. The tubes were incubated at 37°C for 18 hours, following which their turbidity was examined against light according to the clinical and laboratory standard institute (CLSI) guidelines (16). The lowest concentration at which the tube did not show turbidity was considered the MIC. To determine MBC, 20 μL of medium was taken from the tube considered the MIC and the next tubes and inoculated on Mueller-Hinton’s agar plates. Then, the plates were placed in a 37°C incubator for 18 - 24 hours, following which the results were recorded (17). The lowest concentration at which no colony growth was observed on the plate was considered the MBC. According to the MBC, 5 μL of the microbial suspension (1:500 dilution of the 1 McFarland standard) inoculated on 10-mg cuts of the film was placed into the test tube. The films were sterilized under a UV lamp (200 - 280 nm) for 12 hours. Then, 500 μL TSB was added to the films. Immediately after adding TSB (zero time) and after 4 and 8 hours, 50 μL of the medium was taken and inoculated into 20 mL Mueller-Hinton melt agar (Sigma; USA) medium by using the pour plate technique. After 18 - 24 hours of incubation at 37°C, the colonies were counted (17). Morphological evaluation of the film formulations showed that pure PVA generated smooth and uniform nanofibers with a mean diameter of 1064 nm, which upon addition of 20% and 40% mafenide acetate, decreased in diameter to 418 and 102 nm, respectively (Figure 1). In vitro release tests show that all film samples containing mafenide acetate released over 50% of their drug within 30 minutes, (Figure 2). Films containing 40% drug had a faster release rate than those containing 20% drug. The results also showed that chitosan/PVA blend nanofibers had a lower release rate than did pure PVA nanofibers, which can be attributed to the lower solubility of chitosan compared to that of PVA at pH 7.4. Higher transmittance of the medium represents a lower rate of microbial growth (Figure 3). To study the antibacterial effect of the films, the MIC and MBC of mafenide acetate were first measured against both the microorganisms tested in this study. MIC and MBC were 20 g/dL and 40 g/dL for S. aureus and 0.125 g/dL and 8 g/dL for P. aeruginosa, respectively. The results of the antibacterial effects of various films are shown in Figures 4 and 5. Figure 5. 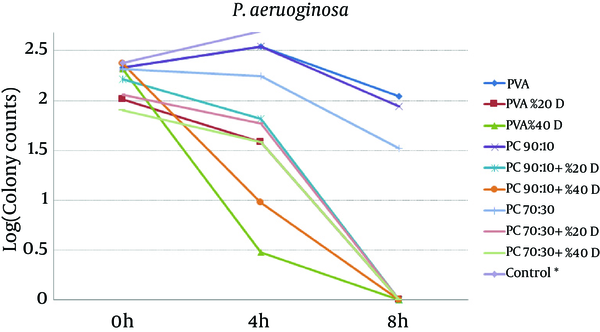 Effect of Nanofibrous Films Prepared From PVA And Chitosan (Containing 20% and 40% Mafenide Acetate) on Growth of Pseudomonas aeruginosa (* Control Was Uncountable: > 400 Colonies Observed After 4 Hours). The results revealed that chitosan/PVA nanofibrous films could inhibit the growth of both microorganisms, which is attributed to the antibacterial effects of chitosan (18). With respect to P. aeruginosa, addition of mafenide acetate into nanofibers led to a considerable decrease in bacterial count after 4 hours and elimination of viable bacteria after 8 hours. As expected, the rate of reduction in microbial population was greater for nanofibers containing 40% drug. With respect to S. aureus, the formulation containing 20% drug reduced the microbial population remarkably, but could not eliminate it after 8 hours. This observation could be explained by the sensitivity of P. aeruginosa to mafenide acetate, which was confirmed by the MIC and MBC. Another reason could be the lower rate of drug release from nanofibers containing 20% drug, resulting in a lower concentration of drug being accessible to the bacteria (Figure 2). The results also indicated that blending various amounts of chitosan with PVA led to thinning of the nanofibers in the range of 441 - 652 nm, with bead formation being observed at high concentrations of mafenide acetate. Since chitosan and mafenide acetate are ionized in solution, their addition to PVA solution increased the charged density of the polymer blend, resulting in stronger stretch forces on the ejected fiber jet and formation of ultrafine nanofibers (19). To evaluate the ability of different nanofibrous films to resist microbial penetration, the microbial penetration test was used. Penetration of microorganisms through the film into the test tube containing medium causes microbial growth and increased the turbidity of the medium. Intensity of the turbidity directly correlated to the microbial growth rate and consequently to the rate of microbial penetration. To determine the intensity of the opacity, transmittance of the medium was measured at 600 nm. In this test, intense turbidity of the positive control tubes indicated that nutrient broth medium is suitable for microbial growth. Lack of turbidity in the negative control tube is indicative of the maintenance of sterile, microbe-free conditions during the experiment. The results show that almost all of the studied films were able to prevent the penetration of microbes into the medium; as a result, the medium showed transmittance that was similar or close to that of the negative control tube. These results indicate that despite the films’ porous and non-compact structure, they do not allow the penetration of microorganisms and can be used to protect wounds from secondary bacterial infections (14). The first reason for this observation could be the small size of the pores in the nanofibrous membrane, which is sufficiently smaller than the size of the microorganisms; this feature ensures that only air and water vapor permeates the membrane, while airborne microorganisms are trapped in the pores. Another reason may be the presence of NH3+ groups on chitosan, which can bond with negatively charged bacteria and inhibit their penetration (20). According to Figures 4 and 5, it is clear that all drug-loaded formulations could reduce the number of bacteria, whereas in control samples (tubes without films), both microorganisms showed rapid growth, such that after 4 hours, the number of colonies was not countable (> 400). The results showed that compared to the pure PVA films, drug-free formulations containing chitosan have shown antimicrobial effects, which can be attributed to the antimicrobial properties of chitosan. The antimicrobial effect of chitosan and its underlying mechanisms have been reviewed recently (21). It seems that the main mechanisms underlying the antimicrobial effect of chitosan are alteration in cell permeability, structural damage of the cell membrane, and interactions between charged groups. It is also supposed that chitosan applies its antimicrobial effect through bonds with sialic acid and phospholipids, by the penetration of its oligomers into the cell, and by inhibition of transcription (18). For both microorganisms, a comparison between drug-loaded formulations and drug-free formulations indicates that the release of the drug from the formulation resulted in a reduction in the viable bacterial count. These findings are in a close conformity with those of the in-vitro release tests. The higher the amount of drug in the film formulation, the stronger and faster is the antibacterial effect observed. Overall, the results of this study indicate that both drug-free and drug-loaded nanofibrous chitosan/PVA membranes have full functionality for protecting wounds from secondary bacterial infections. Moreover, compared to drug-free films, films containing mafenide acetate exhibited a greater antibacterial effect on the studied microorganisms; hence, these films can be considered for future studies evaluating their application as a wound dressing with protective, healing, and antimicrobial effects. Further animal studies using these nanofiber formulations have been planned. The authors wish to thank the vice chancellor of research of Ahvaz Jundishapur university of medical sciences for the financial support provided by the institute. We also acknowledge the infectious and tropical diseases research center, Ahvaz Jundishapur university of medical sciences, for their kind cooperation. Authors’ Contributions: Mohammadreza Abbaspour has participated in conception and design of the study, data analysis, drafting or revision of the manuscript. Behzad Sharif Makhmalzadeh has participated in conception and design, Behjat Rezaee was involved in performing the study and acquisition of data, Saeed Shoja and Zohreh Ahangari have participated in performing microbial tests, data analysis and revision of the manuscript. Funding/Support: This work was supported by a grant (No. N-03) from the vice chancellor of research, Ahvaz Jundishapur university of medical sciences.